Garlic and Rosemary Roasted Potatoes - A fun twist on a classic recipe! I used to think I was an adventurous kinda guy. A hike with the dogs in the Adirondacks? Sure! A quick trip up to Montreal for a night? *car started already* Sasquatch hunting in the backyard? Sign me up! But then recently I found myself on a plane reading the magazine from the seat back pocket in front of me. That’s when I learned that a tour guide is now offering underwater expeditions to see the Titanic. Yes, that Titanic. The one that’s currently resting 2.4 miles below the ocean’s surface. That’s when I realized that my adventurous self had moved out. I’m a huge history buff (particularly Roman history and medieval history), so the chance to see the actual Titanic is pretty cool. But then I realized that the Titanic is nearly 2.5 miles underwater. That’s a long way down. In a small submarine. A private firm based in Everett, Washington plans to offer tours of the Titanic. Very real tours. Like 2.4 miles under the ocean’s surface tours. They are currently in the testing phase to make sure their submarine can dive to the Titanic’s depth, and the first tours are planned for 2019. The cost? $105,129. That’s the price of a first-class ticket aboard the ill-fated ship–adjusted for inflation, of course. The sub will have 54 seats, and the first planned trip is already sold out. Only 200 people have seen the Titanic since the wreck was discovered back in 1985. The opportunity to see this ship sounds awesome. It really does. But I’m a wimp. The idea of diving 2.4 miles underwater just doesn’t appeal to me. Heck, only 5 subs in the world are capable of that. Well, technically only 4 since this Titanic tour sub still needs further testing. I’ll just have to keep up with the Titanic adventures on tv and the interwebs. I much prefer to spend my days playing t-ball in the backyard with Robbie. Or hunting sasquatch. Or making these Garlic and Rosemary Roasted Potatoes. Say what? Roasted potatoes? Sign me up for that adventure! These Garlic and Rosemary Roasted Potatoes are nothing short of awesome. Whenever we make these, I literally stand at the stove pulling out slices of potatoes and eating ’em right there in the kitchen. I have no shame. And a tiny little twist takes these roasted potatoes from normal to amazing. Well, technically it’s a 90-degree twist. Instead of laying the potatoes flat, just stand them up on end. You can get creative like I did here by arranging them in a circle in a large cast iron skillet. Or you can just stand those taters up in a row. Both ways work. 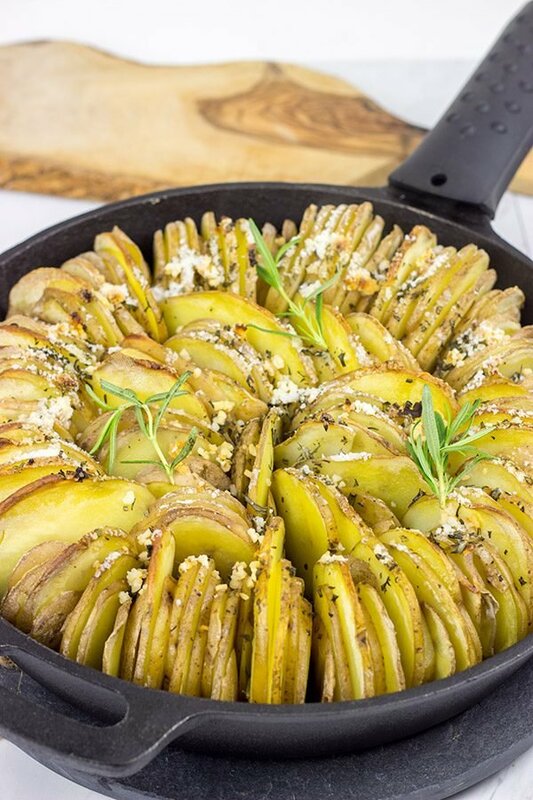 Let those potatoes bake for about an hour, and you end up with sliced potatoes that are perfectly soft on the bottom and deliciously crispy on the top. The recipe for these Garlic and Rosemary Roasted Potatoes calls for a 5-pound bag of potatoes, and I’m fairly sure I could eat the entire thing. I probably wouldn’t feel too great afterwards, but I bet I could do it. We’re always looking for fun and interesting side dishes, and I have to say that these Garlic and Rosemary Roasted Potatoes fit the bill. Heck, we’ve already made these for company twice! If you make these potatoes, let me know what you think in the comments below! Enjoy! Did you make these Garlic and Rosemary Roasted Potatoes at home? Leave a comment. Or snap a photo and tag me on Instagram (@Spicedblog). Cheers! 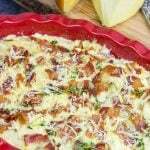 Looking for more fun potato recipes? Try one of these! Using a large (11-12") cast-iron skillet or large baking dish, brush the bottom of the pan with melted butter. Using a mandolin or knife, thinly slice potatoes. 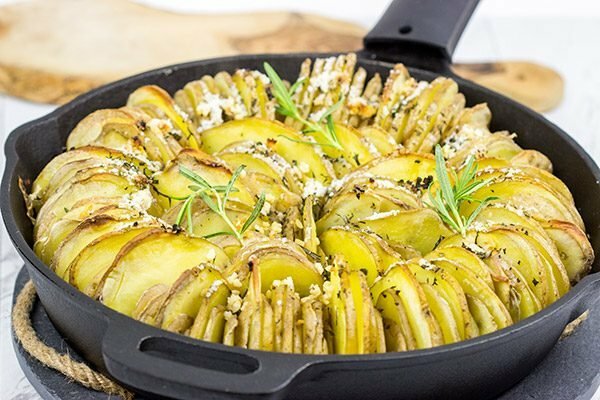 Arrange potatoes vertically in skillet. 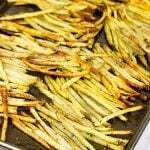 Pour remaining melted butter on top and then sprinkle tops of potatoes with minced rosemary, garlic and kosher salt. Cook for 60-70 minutes, or until tops of potatoes begin to turn crispy. I’ll stick to the potatoes. They sounds fantastic. As you may know, seasoning potatoes with garlic and rosemary is *the* classic way to roast them in Italian cookery. And for good reason! The flavor is hard to beat. Only difference is olive oil instead of butter—and lots of it, as they soak into the potatoes and make them really tasty. But I’m going to try butter next time and see how it goes. Hah! Love the word play there, Frank. As fun as it would be to see the Titanic, that’s just a little bit much for me…both in the cost and the concept. Like you, I’ll stick to the kitchen! These potatoes are seriously amazing! The seasonings are simple, but perfect. And now you’ve got me intrigued about the olive oil instead of butter. How about this? You try ’em with butter. I’ll try ’em with olive oil. 🙂 I bet both ways are fantastic though! Hi David! At first glance these looked like hasseback potatoes and I guess they are similar. I don’t really care what they are called these sound delicious! I think they would be a great side dish on Easter along with leg of lamb. I use rosemary a lot, I grow it in my side garden off the back porch. Last year when it started to get cold I cut it all off and hung it in the pantry to dry so I have a ton of dried, but fresh is always best! You know, these potatoes really are similar to hasselback potatoes. The only difference is these are sliced all the way through and then stacked together. This would be a fantastic side dish for Easter! 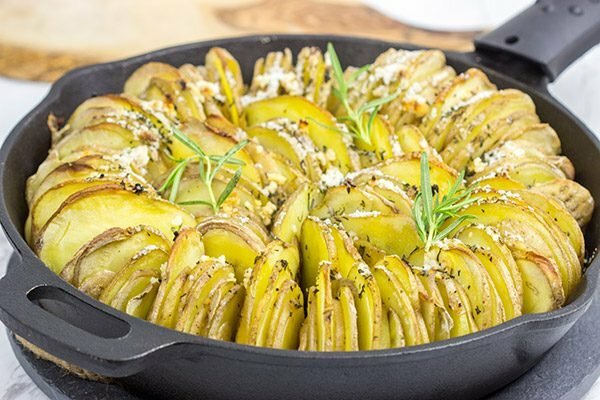 It’s fairly easy to prepare (other than slicing the potatoes on the mandolin), and it’s impressive to serve. I tried growing rosemary once up here, but it didn’t make it. I should try a new pot of it now that we’re settling into the new house. Thanks for the idea! David, you are not less adventurous – you’re simply being reasonable. First of all, I would be concerned about diving more than 2 miles underwater too. Secondly, no consideration until all tests have been completed, and until the company’s managers had at least few trips themselves! Lastly, the ticket price is probably highly overrated, and it might be significantly reduced soon after launching the project. Obviously, I don’t see any reason we cannot wait a bit (or for good haha). Besides, culinary adventures are so much more fun than an opportunity to see Titanic. And, now please pass me this skillet and a huge spoon. What I’m not going to leave alone though are these potatoes! I love this new method of cooking ’em! Thanks, Ben! Thank you so much, Sherry! I’m a huge fan of this style of cooking potatoes. You get the perfect combination of crispy and soft! Also, I hear ya on being that far underwater…umph. I’m with ya – no going under water in confined spaces! I’m also with ya on these potatoes! Double yummers!!! I love potatoes of almost every kind and these look scrumptious. This looks like a perfect side dish! Yup, we don’t need to do anything to encourage more nightmares, Kelsie! Let’s just eat a bunch of these roasted potatoes instead, ok? Perhaps we can turn on the movie Titanic. Eh, skip that. Let’s just eat potatoes! Also, potatoes and popsicles. Isn’t that what you eat now!? 🙂 Oh, and cake! Hahaha. Kidding!! Wait – so, trekking 2.4 miles under water would set me back $105,129 – that’s one expensive trip – heck it’s the price of a decent home, here in Athens! 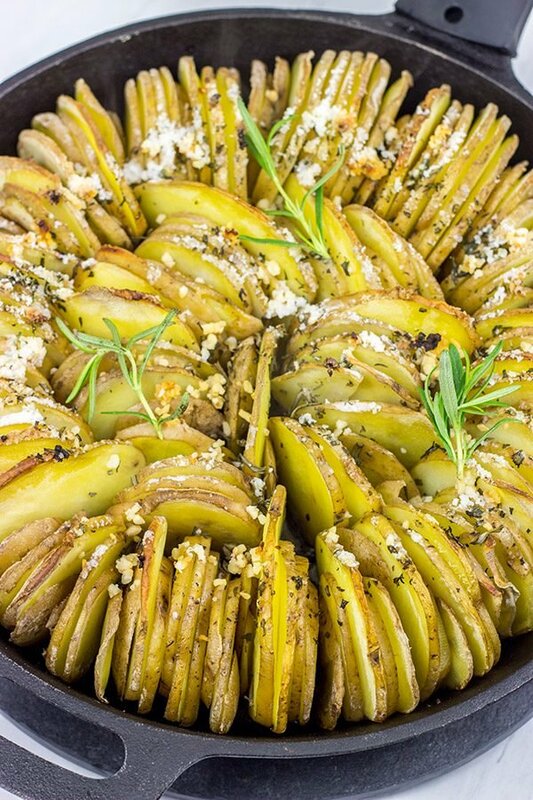 I’m with you – I’d much rather fetch the ball when you and Robbie played t-ball … or hide from, er, I meant hunt sasquatch myself… or eat (and I meant eat) these Garlic and Rosemary Roasted Potatoes! 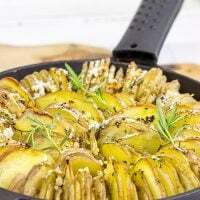 We love potatoes down here and are looking for new ways to enjoy them so these hasselback-looking skillet potatoes are a must try soon, my friend! Tell me about it! I don’t exactly have $100k to spend on that trip, although it would be kinda cool to see the Titanic. But, yes, we’d prefer to play ball and hunt sasquatch, too! How about this? You come up and dress as sasquatch and run through our backyard. I’ll make another skillet of these potatoes as a thank you. Haha! Oh wow – that would certainly be a unique opportunity, but I find the idea of being that far underwater quite scary! These potatoes look delicious 🙂 I love the way you have presented them! 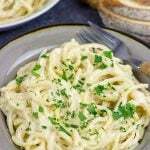 And garlic and rosemary is such a great flavour combination to serve with them! I’m with ya, Alexandra! It would be cool to see the Titanic, but that’s a bit much for me…both in price and concept. Still fun to think about, though! In other news, these potatoes. Make them. Today. They’re so darned tasty!! 🙂 Thanks so much, my friend! David, these potatoes are awesome. Standing them up in the pan like that gives them the most wonderful texture – especially the crispy tops! Beautiful. I love the presentation. I’d suggest just watching the movie!!! No way man they couldn’t pay me $105,000 to take that tour. That ship lies in bad waters. Could be cursed you know. But, I’d pay for a chance to eat your Garlic and Rosemary Roasted Potatoes. They got me thinking of deconstructed Hasselback potatoes. I’ve got to try these. You make a good point, Ron. Also, part of me just says we should leave it alone. I’m ok with folks going down to the Titanic to learn and/or salvage for historical purposes. But to turn it into a tourist attraction? Eh, I dunno. I love history and all, but that feels like a bit of a stretch. Either way, these potatoes are amazing! They seriously are my favorite way to roast potatoes. The only difference is spending the time to slice ’em up on the mandolin first. Totally worth the time! I’m a whip too David, you won’t find under the sea just like you won’t see me on the first ride in space when it is opened to civilians. Now your potatoes, on the other hand, our an adventure I would love doing. Delicious! Yup, I hear ya, Karen! Something about going 2 1/2 miles down in a small vessel just gives me the jitters. But these potatoes? Definitely worth the adventure here! 🙂 Thanks so much, my friend! How large of a pan did you use for this? Thanks- looks yummy! LMAO – ‘my adventurous self moved out’!! Ha! I know what ya mean though. These tatos have my name all over ’em, David. There ain’t no going wrong with garlic + rosemary. Plus, the presentation is BEAUTIFUL! Pinned! Happy Friday to ya. P.S. would it be too adventurous to add more garlic 😉 ?? I’d have to hard pass on being 2 1/2 miles under water, though I agree that it would be amazing to see the Titanic close up that way. 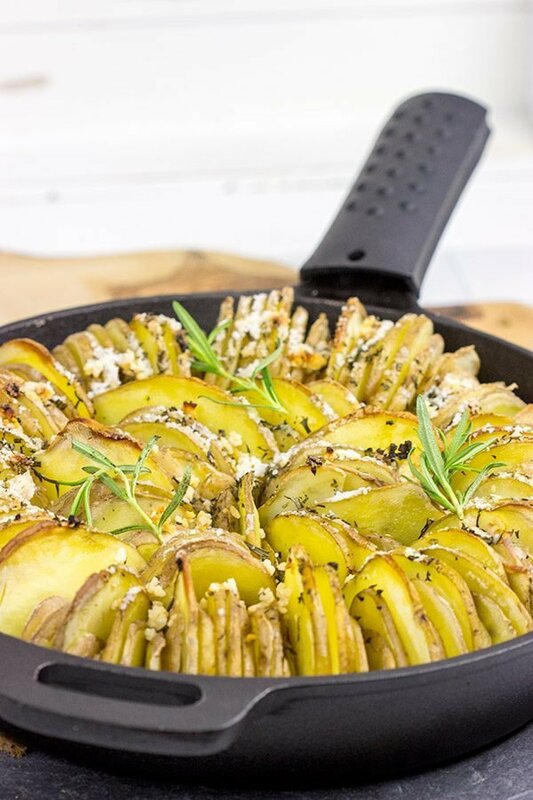 This potato dish of yours is knocking me out for so many reasons: simple, but elegant, welcome at any meal of the day, and you can never go wrong with potatoes, garlic and rosemary! Snorkeling is about as far as I go. Ha! There’s nothing I love more with potatoes than rosemary, and this is so beautifully presented, David. Love it! Haha! I think snorkling leaves you, oh, about 2.4 miles above the location of the Titanic still. I’m with ya, though. That’s a long, long way down! Thanks so much, Valentina! I hope you and the family had a great weekend! I’m always looking for recipes for my cast iron skillet. And ones that I can get my rarely used mandelin out for David so thanks for this garlic and rosemary roasted potatoes dish. I’m not sure if I’d be up for that trip down to see the Titanic. I mean there’s not a lot to see on the way down is there? I’d have to be entertained preferably with something to eat! I’m the same way, Neil! Our cast iron skillets get used quite often, but the mandolin stays in the cupboard most of the time. But these roasted potatoes? They’re a great way to show that mandolin some love! You guys are adventurous folks…how about you go down to see the Titanic and then report back? 🙂 I’ll send potatoes in exchange! If I were to choose between carrots and potatoes, I still go with potatoes. Its not that I hate carrots, but I not fond of eating them. The photos looks delicious with rosemary in it. Can’t wait to try some of this one. These potatoes are so cool looking! I’ve been craving all things potato ever since I got pregnant, so I’ll be making this for sure. Onto the topic of the Titanic tour, I think I would do the trek underwater, but not at that price tag! Though I do think it’d be cool, I really am not *that* interested in seeing the Titanic. You know how many adventurous trips I could go on around the world with that money?!! You make an excellent point about the pricetag! I do like the idea of seeing the Titanic, but I could take so many more adventures for that same amount of money. Good call, Nicole!